DOUALA: Can a “pot in a bag” help fight climate change? 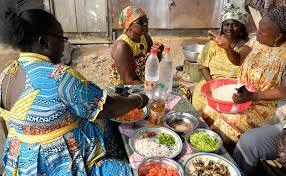 Some Cameroonian housewives who think so are using the clever new fad to stew up their tasty rice and tomatoes. The fireless cooker, which looks like a bag and comes in colourful traditional prints, works on a simple principle — it retains heat. Made of polystyrene and cloth, it sells for between 10,000 CFA francs ($17) to 22,000 and is made and sold by an NGO helping the needy in the country’s heavily polluted economic capital of three million people, Douala. One perk is it lasts forever. But aside from helping people save money, the goal, says Catherine Leugue who runs the NGO, is “to save gas, wood, carbon and petrol”. “We contribute in our own way to protecting the environment because our fireless cooker bags do not emit smoke,” she told AFP. Does the food taste as good, though? Sitting on benches peeling onions and chopping carrots, peppers and leaves, a group of women prepared a local delicacy — sauteed rice with tomatoes and herbs. The potpourri of fresh ingredients first was thrown into a traditional pot to be heated up using a firewood or gas-powered stove. Just as the vegetables reached boiling-point, Leugue added five bags of rice, five litres of water and seasoning for local flavour. “It’s important to add enough water, salt and seasoning because once we put the pot in the cooker, we won’t be able to open it again until the meal is ready,” she says. The downside for the hungry is that using the bag means an extra 45 to 50 minutes to cook. “Cooking in the bag takes longer, but that’s not a problem because I can do other things meanwhile,” said Marie Siendjeu. “I like it,” she added. “I use four times less firewood and sawdust now and I can cook all kinds of dishes in the bag. As the bag started to steam, “Dinner’s ready!” called out Leugue, who aims to hit local markets next in order to attract more customers.